June 2013. One of the things I absolutely love about the running community is those spontaneous moments of camaraderie we strike up with previously total strangers on race day. 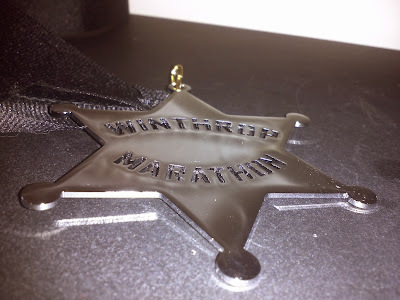 This is my race report for the Winthrop Marathon. I'll keep my part relatively short because really this is the tale of Bob Hoekman. The course: The starting line is reached via one hour bus ride from Winthrop. The start is deep in the Okanogan National Forest, on a steel bridge crossing the Chewuch River with an elevation of about 3000 feet. The road parallels the river back down the mountainside, breaking out of the woods around Mile 16 and transitioning to the high, open pasture common in this area. At this point the elevation is about 1500 feet, and its rolling hills and grassland the rest of the way. 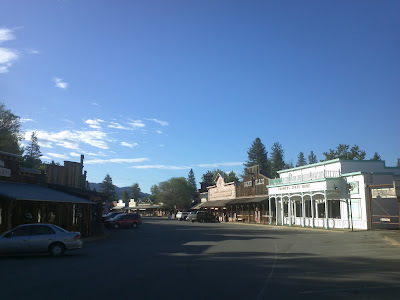 You reach the town of Winthrop at Mile 23, then do a 1.5 mile out and back out the south side of town, make a sharp U turn upon returning to town, and finish on the main street. Start time temperature was about 50 degrees, but once out in the open the temperature ranged from mid 70s to 80 under a cloudless sky. My part: My plan had been to run a fast start over the first 10 miles to take advantage of the steepest downhills, and then to ease off and take a much more relaxed pace with lots of breaks and walking as needed over the last 16 miles. I was also conscious of being completely out of energy at the end of the Seattle Marathon, and craving Gatorade as the only thing that would get me through to the finish. So I took 20 oz of Gatorade on my fuel belt to provide a late race supplement in addition to what the aid stations along the way provided. I ran a great race for 22 miles. At mile 10 I was under 9 minutes per mile, and I was disciplined enough to take that down to about 10 minutes per mile over the next section; a little faster on the downhills, a little slower on the uphills. At Mile 22 my time was 3 hours and 50 minutes, well ahead of my Seattle Marathon pace and seemingly on track for my desired finishing time of under 4 hours 30 minutes. But I did not account for the relentless and cumulative effect of the heat, dry air, and sun. I craved water more and more. Mile 22 arrives at end of a gradual but lengthy 2 mile uphill grade, and as I staggered through to Mile 23, I realized I was spent. I was feeling a bit of a headache, a bit nauseous, and feeling a growing tingling sensation around my scalp. The gatorade in my fuel belt did not appeal to me at all, and all I wanted was to get to the next aid station and water. Heat stroke was not something I was willing to risk, so I slowed to a walk, and then slowed to an even slower walk. It took me 25 minutes to cover Mile 24, and another 25 minutes to cover Mile 25. Finally my body had recovered enough to resume a slow jog, and I covered the last 1.2 miles in 14 minutes. There's nothing quite like the feeling of turning the corner for the finish line and seeing your family waiting there for you. People were clapping and cheering, but the only thing I heard was my son yelling, "Mom! Mom! It's Dad!" A week early, but it was the best Father's Day present ever. Finishing time: 4 hours 54 minutes. But enough about me. At Mile 2 this guy pulled up next to me, and as we seemed to be at about the same pace we settled in running side by side. After a hundred yards or so of this, he said, "Good morning! I'm Bob Hoekman, and I'm from Houston, Texas." Glancing at Bob, he was clearly older than me, but I wouldn't have said by much. My guess would have been late 50s or early 60s. And he was hard to miss. He stood about 6' 3" and was wearing a fluorescent yellow running shirt. I replied, "Good morning. 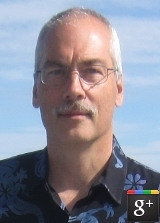 I'm Mark, and I live near Tacoma, Washington." We ran quietly for another minute or so, and then Bob commented, "Not sure how I'm going to do today. This is my fourth marathon this year, and my legs are a little tired." "Well this is my second marathon ever," I replied. "I started running again when I was 49." "Well good for you," Bob said enthusiastically. "I started running again when I was 46." I had to ask, "How old are you now?" Bob grinned, and said, "I'm 71." There was silence for a bit while I digested that information. Then I said humbly, "I hope I'm still running marathons when I'm 71." Bob let out a big laugh, and said, "I hope I'm still running marathons when I'm 91!" And so we ran and chatted from Mile 2 to about Mile 7. Bob hales from Texas, but has a home in the Winthrop area, and this was his third time running the Winthrop Marathon. He's also run the entire course as a training run. His last race was in Kalamazoo, Michigan, where he and his wife were visiting his mother-in-law. I didn't ask how old she was. Around Mile 7 our paces began to get out of sync, and we separated a bit. But Bob was always easy to spot with that bright yellow shirt, and he was never out of sight either in front of or behind me. At Mile 13 we passed the half marathon start, and slow and steady Bob and I began passing the tail of the half marathon pack. Around Mile 17 it was me catching up to him, and I asked "How are you doing?" "Not so well," he acknowledged. "I've been battling a viral infection, and actually thought about skipping this race. But I woke up without a fever this morning, so I figured I'd give it a shot." I pulled in for a water break and some food at Mile 18, and Bob soldiered on. At Mile 20 I spotted his yellow shirt up ahead. He was walking, and walking next to him was a young, attractive, and very fit brunette. As I squinted at the glaring sun overhead it seemed to me like a good time to take a walking break too, so I slowed down next to them. Bob grinned, and said, "I've had a bit of an irregular heart beat, so I'm taking it easy. This is Holly. She's a nurse, and she's looking after me." Holly and I introduced ourselves. She's mainly a trail runner, a Cross Fit / Tough Mudder / Warrior Dash type, never having run anything over 10 miles. She had signed up for the half marathon on a whim. Some 10 minutes later Holly and I had resumed running, and pulled a bit ahead of Bob. I asked, "Is he going to be okay?" She rolled her eyes, and gave me a look of complete disgust. "He's a doctor," she said. "They make the worst patients! But don't worry, I'll keep an eye on him." I pushed on, leaving Holly and Bob behind. I stopped looking behind me, getting that tunnel vision that comes with end of race focus and fatigue. But sure enough, at Mile 25, as I was in my own struggle to keep putting one foot in front of the other, Bob jogged by me, huffing and puffing. He had tunnel vision too; I don't think he even saw me. But then he hit the turnaround point on the out and back, and we passed each other again, this time in opposite directions. He looked up, saw me struggling, and gave me that big Texas smile and a thumbs up. That certainly made my day, and it was just the boost I needed. Bob finished about three minutes ahead of me, with a time of 4 hours, 51 minutes, and 13 seconds; a true testament to running for a lifetime.